There are a lot of ways to consume beetroots to reap their fantastic health benefits. Beets are a great source of antioxidants, support heart health and have been shown to boost athletic performance. So, it stands to reason that getting more beets in your diet when exercising is a good thing. Once peeled and cleaned, beetroots can be baked, boiled, roasted, put in soups, added to smoothies, pickled and can even eaten raw. Incorporating beets into your daily diet is not hard, especially if you are armed with these five incredibly easy and delicious beet recipes. When it comes to eating healthy, many people will say snacking is their downfall. Make lots of these delicious chips and have them handy for when the urge for a crunchy, salty snack hits. Place thinly sliced beets in a single layer on the baking sheets, drizzle with oil and sprinkle with sea salt. Bake at 200 degrees for 1.5 hours. Rotate pans from top to bottom racks (if using multiple sheets) and bake for an additional 1.5 hours. Let cool for 30 minutes and serve. Roasting beets is a great way to bring out their flavor. 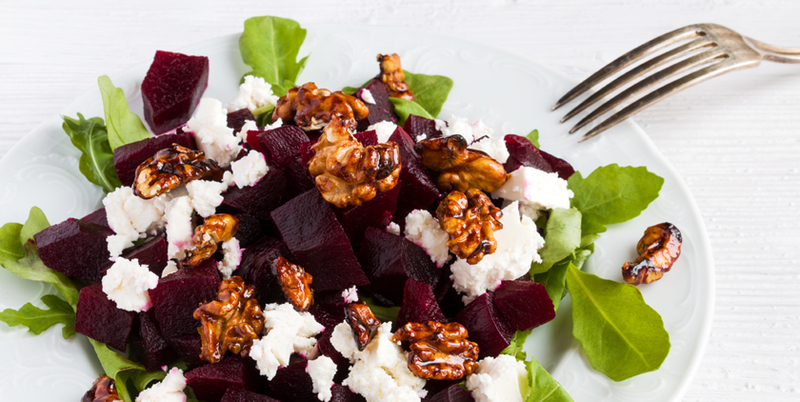 Try this beet recipe for a healthy side dish. Clean and peel beets and cut into one-inch chunks. Place cut beets on the baking sheets and drizzle with olive oil. Season the beets with sea salt and pepper. Roast in oven for 35 to 45 minutes, turning over the beets every 15 minutes with a spatula. Remove from the oven and place in a bowl, then toss with vinegar and orange juice. A great way to start your day, this power smoothie delivers a healthy dose of vitamins, fiber and MCTs. Juice all your raw ingredients. Add one scoop of BPI Sports Green Tea + Beetroot + Fiber + MCTs. Did you know you can eat beetroots raw? Enhance the earthy flavor by adding some citrus and sea salt. Cut beetroots into small chunks and add to bowl. Next, add orange and lime juice. Drizzle with olive oil, sprinkle with sea salt (to taste), then toss to combine. Finally, top with sliced almonds and chia seeds before serving. This lightly pickled beet recipe is great to keep around as a side dish or to add to salads and burgers. Wash and skin beetroots and place in a medium saucepan. Cover with water and bring to a boil over high heat. Reduce heat, cover and let simmer for 45 minutes. Drain and rinse beets in cold water. Slice thinly and place in a bowl. Combine vinegar and sugar in a small saucepan. Bring to a boil and let cook for 5 minutes. Stir salt, dill and bay leaves into vinegar mixture. Pour vinegar mixture over beets, then cover and chill. Discard bay leaves and pour into mason jars. Chill for 20 minutes, then serve. For more information, check out The Amazing Health Benefits of Beets.